Ready to feel clear, refreshed and confident? Today is the day to supercharge your happiness and wellbeing. We are here to support you with tools and information to make your rejuvenation fun and easy. Reset your routines to reduce chronic pain, eliminate cravings and eradicate emotional eating. Learn about foods in their purest, most unprocessed form in order to scrub your digestive system of potentially inflammatory foods and nourish your body. Acquire the tools that will let you build nutrient rich meals that promote efficient digestion, absorption and weight loss. Am I going to spend seven days drinking only juices? No, our reboot takes you back to the basics. You eat real food at meals and take in liquids between meals. 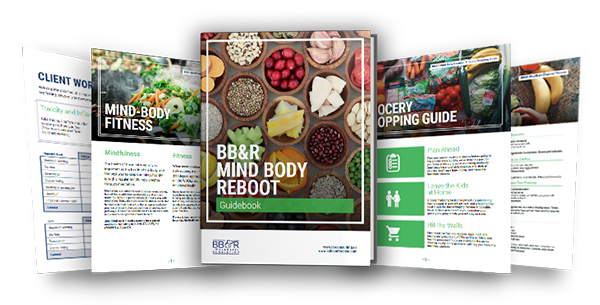 When you reboot with food that is free of hidden ingredients like artificial colors, antibiotics, and chemical inventions, you reduce big inefficiencies in the way your body processes food. We guide you toward the foods that encourage natural and gentle detoxification of the body’s most vital filtration system: the liver, kidneys and the colon. Do you include planning tools with the reboot? Yes, you will receive sample recipes, a grocery shopping guide, workbooks to track inflammations and progress, daily emails and detox drink and tea recipes. Who is the Reboot For?